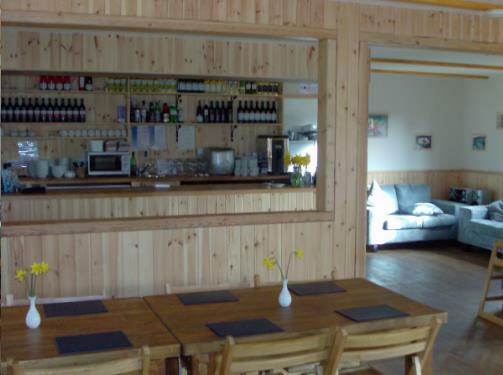 Adam's Fish and Chips is a family run restaurant and take away situated at Higher town, St Martin's in the Scillies. We have inside seating for 40-50 people with picnic tables under the canopy for a further 40-50. Tables can be booked out well in advance so it is as well to book in to avoid disappointment, and we are a very small team so it helps us plan the evening to avoid unnecessary waiting times and delays. Our food is of course freshly prepared so the chef could do with an idea of how much stock to prepare, even for a take away! If you have a special occasion such as a birthday, staff outing, wedding party etc please ring and let us know what your requirements are and we will see whether we can accommodate you. We can do food other than Fish and Chips believe it or not, try us. As a rough guide though a party of less than 20 is not very economical with our time for organising, staffing, overheads etc. Also if you want the building to yourselves it is best to think outside our published opening times. If you require alcohol at your function you will need to give us at least 3 weeks notice to allow us time to obtain a Temporary Event Notice from the local Council.